You are here: Home / Blog / My duck story…….after they flew!! and here they are BACK!!! My duck story…….after they flew!! and here they are BACK!!! Well……when the ducklings flew………(the last nine of the three groups..) I missed them! 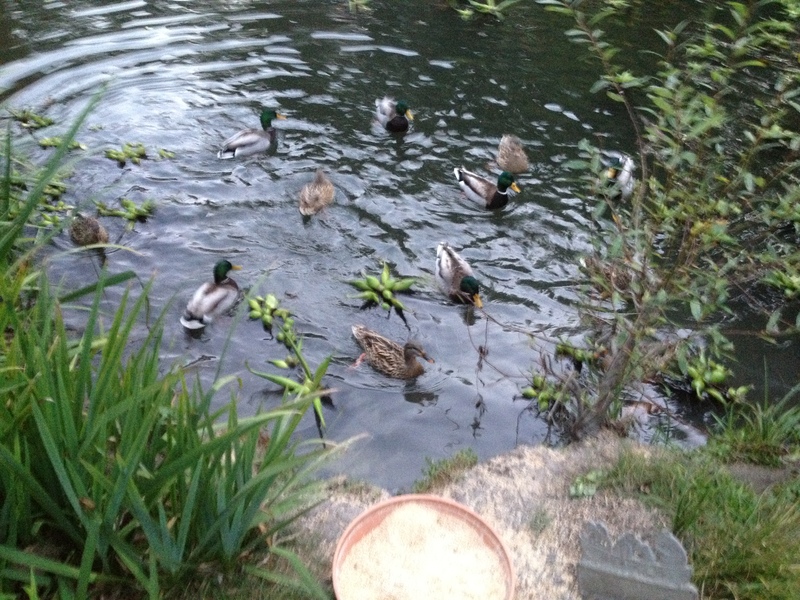 I was so happy they all lived…..but I must say…..just picture a pond with a Mom and Dad duck and 9 ducklings…. ….and then……one day…..none. I didn’t cry. But I felt like it! they flew on a Thursday….and the parents flew with them! I was elated that they all survived the “sitting duck” stage….however; I did miss them terribly. (less than a mile) on a golf course, called me to ask for my advice on the “trim color” on her house! (my adorable brother says……….”if you ask my sister her opinion…and she doesn’t have one…….rush her to the hospital immediately!!! and my back is to the pond and I am talking and pointing to the trim….giving my opinion! We turn around……there are two ducks steaming across the pond……and they get out….walk through the garden…….walk up to us within a foot of us and look right up at me! I said…..”Oh, so sorry, CeCe! These are “My ducks” they recognized my voice! I think it is the biggest compliment I have had in my entire life!! Honestly! and here they are BACK!!! There are 6 pair in our pond every day! I didn’t get a photo of all 12; but they are there!!! There are twelve every morning! And when they hear my voice…..or my feet on the gravel they steam right up to me! My favorite stories of our lives are things like this! Thank you for reminding me! It is truly a wonderful and happy story! Previous Post: « What I am thankful for!!! One of the biggest surprises; and one of the biggest gifts of my life! Mother’s Day reprise!!! Congratulations on your new “family”! Good Morning…wonderful evening ,wasn’t it? Oh, Penny!! All our little ducklings fly, but hopefully they will stop home for a visit. Beautiful story, and one of the best I’ve read of late. Loving nature is always rewarded with rich surprises. fabulous…… makes me cry happy tears !!! I just LOVED your funny and remarkable duck story. I giggled so hard I almost wet my pants! So thanks for that uplifting story! Me too – those things mean so much more than so much else. And I think there’s a lot more cross-species communication than people think. One of my daughter’s pet rabbits, just hours before he died (at the grand old age of 11) tilted his head back and looked me in the eye and held my gaze for some seconds. It was one of the most powerful moments of my entire life and I shall never forget it. I’m glad your ducks are back and I’ll bet they are too! Absolutely thrilling!!!! When a Wren comes back to me in the Spring, I feel like Mother Nature in OVERDRIVE, so happy you are the same. What a fabulous story! You must be a duck wisperer. Have you read ‘The Story of San Michele’ writen by Axel Munthe? I think you are kindred spirits. There was another incident summer before last……really moving and truly amazing. I’ll write that one this week! I am so glad people love this! There is so much joy and pleasure in the simplest things! Dig a pond; you will not even believe the animals that will show up! It is so exciting! And it need not be expensive at all!! Guess what? She didn’t tease me any more! Water is the best for wildlife of any kind…….teeny or big. Doesn’t matter! Beautiful story!We had a duck once he was so tame he even fetched a stick like a dog.My boys grew up with him he eventually died in my arms………….we love our animals and I LOVED your story!How lucky you were to have them fly back! Enjoy the season Tis upon us!!!!!!! That is such a heart warming story. Much like the lioness that recognized the men that raised it. Happy Christmas! OHMILORD! Christian and his friend…….I almost died watching that. Thank you….but that was such an amazing thing…..that lion brought his “pride” to those two men who raised him. That was the wildlife film of all time. Thank you for even thinking of it when you read about my ducks. It does prove the connection. You are so right about that! Happy Christmas to you , too! When you live with an open heart (naturally) supernatural things happen and your vibrations (heart signals) are received as unconditional love. Time for you to write a children’s book about all the magical things that happen when you are aware, make room, and respect nature…it respects you too with the sweetest confirmations. Love is a universal language we all understand. Such a wonderful learning experience for this season of giving…Thank You! You know, Penny, I am not surprised one bit at the ending of you amazing story. Ducks are smart. What a wonderful Christmas gift for you! I can not believe they followed your voice—how sweet. Enjoy every minute. That is the secret Lissy! Enjoy every minute! None of us knows when the next minute might be our last! Thank you for your lovely note! It is funny how totally thrilled I was that these ducks knew me! And, I do not have an unusual voice at all! I have a very ordinary voice; they recognized it because I said “good morning ” to them every morning…….and then I fed them! It does not take an unusual voice! They love their food! And I talked to them and told them lots of stories……they recognized my voice because I talked to them! I told them how happy I was that they were here…..and how happy I was their mother was so smart to lay her eggs in the duck house! They heard my voice every day…..a few times a day…that is why they recognized it when they flew to a nearby pond. I truly consider it the best compliment I have ever had……..maybe in my whole life.!!! “”my ” wild ducks…….recognized my voice…….when they few away……and came to see me! Honestly….to me…..life gets no better!!!!! And they associate my voice with their food! (Or maybe they think I am the “mother duck”) comment coming!! Hello Penny, what a lovely heart rendering story – you must have an unforgettable voice! Even small creatures can sense kindness. Do I see a bowl of goodies next to the pond, or is it just my imagination? Not many people can say they are the mom to a family of ducks. You are right. Life is good. I must reply! Not many can say! and, do you think: not many would want to say? I am hoping that many would want to say if they ever experienced it! We’ll leave it at that! Thank you for the magnificent comment! And it is!!! If I were a duck I would come back too! You are the best Mother duck. Another HUGE compliment!!! What can I say!?! THANK YOU! To the ducks and my friends who know how much it means to me….and the ducks!! OH! I forgot to answer Lilliane Plummer! Yes! That is a bowl of “goodies” I provide a bowl of “game bird grower” in a bowl that the ducks (babies and adults) can eat from. I give them “treats” that are actually “turtle pellets” (we have 15 turtles in the pond , too….all rescues)! So, yes…..I do bribe them! They are “habituated ” to me…..but…they are not overly “tamed”! I make an effort about that. They only come when they hear my voice……I don’t ever want them to trust “every human” !! There are some who would shoot them on their way to say “hello”! Penelope: I just LoVE this story!! It’s so sweet and amazing at the same time. I need to hear your voice to see what the ducks heard! Hope you have a healthy and happy New Years!!!! I talk to them every day when I give them treats! It isn’t a “special” voice! It is just “special ” to them!! 20 were back here today!